West Coast Expeditions' (WCE) managing owners, Dave Pinel and Caroline Fisher, are delighted to again sponsor and participate in the Pacific Paddling Symposium at Pearson College, May 2015. This is a homecoming and community-building event for Dave: he first learned to roll a kayak and began sea kayaking in 1985 as a student at Pearson College! There was no turning back - he was hooked on the coast and using kayaks as a way to explore and connect with coastal people and places. Dave enjoyed 3 formative years with Brian Henry at Ocean River Sports in the early 1990's before guiding and managing operations with WCE since 1995. 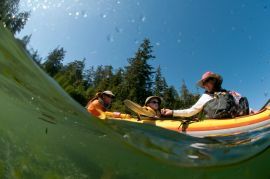 Caroline has been leading kayaking experiences in BC and around the world since 1996. As owners of WCE since 2008, it's truly been a family experience for them and their staff. "Hooray for year three of community building through the Pacific Paddling Symposium! With food, drinks, and paddles in hand, this offers a wonderful community-building event for all of us" notes Pinel, who also reflects that, "Ocean paddling attracts diverse life-stories and perspectives, which fuel rich conversations, learning, and play. Each year's symposium has been refreshing and inspiring - I look forward to this again being the perfect launch to another summer kayaking season, energized by supportive interactions on water and land." WCE is all about supportive interactions. 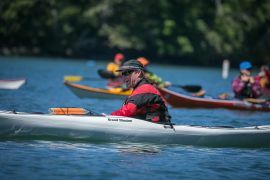 They were recently the first sea kayaking company in Canada to achieve the Green Tourism Gold award through a rigorous third-party assessment. They are also business members of 1% for the Planet, and in 2013 were recognized by the Canadian Tourism Commission as offering a Canadian Signature Experience! 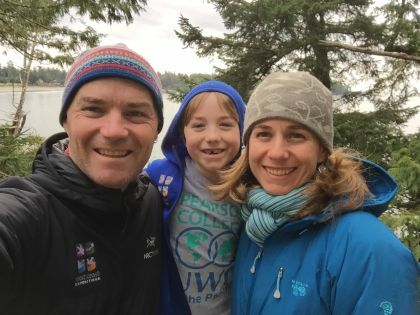 Their kayak adventures are based from an enchanting wilderness retreat near Kyuquot, perched on the outer northwest coast of Vancouver Island. WCE caters to new and veteran paddlers alike, offering an exceptional mix of paddling options, wildlife interactions, and cultural connections - bringing people together for distinct experiences. As hosts of Sunday night's Bon Voyage Hour in the Student Commons Room, Pinel, Fisher, and West Coast Expeditions invite you to hang around and savour the weekend at Pearson College - wrapping up our event in fine form by further appreciating new and renewed friendships for the paddling season and life ahead!